Why do Amish think so highly of farming? Farming is often revered as the “best occupation” for a family, even though farmers are in the minority in many communities today. Agriculture is a way that fathers can remain at home and work together closely with the family, rather than leave home daily to a factory or manufacturing job. Farming also involves working closely with God’s creation, an aspect which resonates with Amish who see stewardship of the Earth as part of their mandate. No. In fact, some Amish greatly dislike farming. Thankfully, not all Amish have to farm. Many go into any of a variety of businesses or work for non-Amish employers in factories and other jobs. While the total number of farmers has perhaps increased, the percentage of the Amish population in agriculture has certainly decreased over the past few decades. 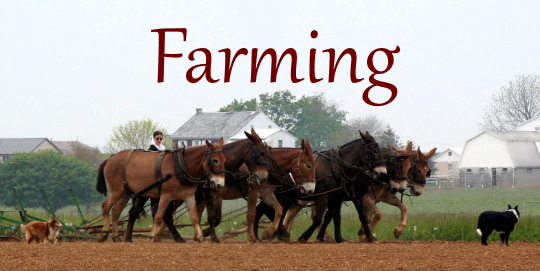 Reasons include farmland becoming too expensive or scarce, large families making providing farms for all sons (a traditional practice) difficult, and the popularity and development of various businesses among the Amish, including construction, woodworking, and manufacturing. The family farm has a special importance in Amish society. Pictured: Holmes County, Ohio community. Some Amish have started low-acreage, intensive produce farms as an alternative to the traditional dairy. Others raise a variety of animals, including poultry, deer, and hogs. Read more. Is all Amish-grown food organic? No. In fact, most foods raised by the Amish are actually not organic. This often surprises outsiders. However, organic farming, while it has taken hold in recent years in some communities, is not the way Amish have traditionally farmed. Conventional fertilizers and pesticides were used by many present-day Amish farmers’ parents and grandparents, and so they continue the same practices today. Yes. Most Amish farms are conventional operations, meaning pesticides and fertilizers are used. While some Amish farming practices may align with trends and beliefs seen in today’s “green” movement, most Amish are not primarily motivated to farm the way they do due to overriding environmental concerns or a desire to “save the planet”. Additionally, most Amish farms are not organic, though organic farming is a growing niche practice among Amish, in part due to financial reasons. Most Amish farmers don’t raise tobacco. However, some Amish, particularly in Lancaster County and related settlements, have a tradition of tobacco cultivation. Tobacco is a cash crop which can help pay for expensive farmland. One Amish tobacco farmer says stripping and sorting the tobacco leaves provides a valuable family activity in the fall. Not all Amish agree with tobacco farming. Kline, David. Great Possessions: An Amish Farmer’s Journal. Wooster, Ohio: Wooster Book Company, 2001. Kline, David. Scratching the Woodchuck: Nature on an Amish Farm. Athens: University of Georgia Press, 1999. Olshan, Marc A. “Amish Cottage Industries as Trojan Horse.” The Amish Struggle with Modernity. Kraybill, Donald B., and Marc A. Olshan, eds. Hanover, NH: University Press of New England, 1994. To Cite this Page: Wesner, Erik J. “Farming.” Amish America. Erik Wesner, 29 Jan. 2015. Web. [Date Accessed]. <http://amishamerica.com/farming/>. I buy in season produce from Old Order Mennonites in Synder County, Pa. Most farms there do not use pesticides. Their corn often gets attacked by “corn worms” this time of year. They encourage purple martins, bats and other beneficial creatures to help with pests. They send the best looking produce to the twice weekly auctions and often sell the less than perfect goods in box lots at hugely reduced prices at the farm stand. It’s perfect for people who “can” or preserve food. They use very little fertilizer. $$$. They rotate crops, plow under planted rye grass and crop residue. They can often be seen at manure auctions (yes there is such a thing) where they cheaply buy by-products from poultry and dairy operations. Big trucks apply the organic material and that’s included in the auction price. Sometimes they will add lime, calcium or copper sulfate to tomatoes to combat blight. They also buy hybrid seeds for their vegetable farms. Many hybrids are designed to withstand pests and other conditions. Lately I’ve noticed that some are using GMO seeds for grain crops. Some are using conventional methods to grow these crops. They tend to hire local farmers to use their tractors for this purpose. Most vegetable farmers are still using horse power. FYI, GMO’s are plants that are tampered with to remove or add a gene to the plant’s basic structure that allows the plant to not be effected by herbicides. Mostly “Roundup”. Spray the field with Roundup before planting and perhaps once during the growing season to kill all the competing weeds for water and soil nutrients. The GMO seeds have no problem growing in this poisoned soil. Yeah this one scares me too. Those crops are then used in the production of animal proteins and ingredients we consume everyday. Desperately looking for a horse farm or wood working shop for my grandson to work. Age 20 – Christian, lean and strong – does not like books; missed his graduation by couple of months. Can’t find a job with out GED or go to vocational school. Likes animals, farming, woodworking. Needs structure in his life – good boy. This may not be the right site for this request, but don’t know where to turn. Try Job Corps. This is a free service provided by the government. Different locations provide different kinds of training, some are live in some are live out. Some provide a stipend and probably all help with GED plus free vocational training. Last I heard cutoff age was 21 so you will need to hurry up.